4K TV. After the failure of 3D TV to capture the imagination (i.e. to sell many units), the next big thing from the broadcast industry is 4K resolution. 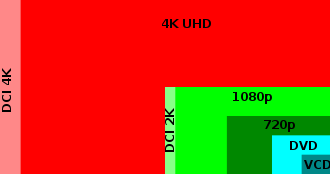 As the graphic from Wikimedia commons shows, 4K resolution will deliver a massive increase in picture quality over existing HDTV. While some commentators debate the real value of it – and just like with cameras, the marginal benefit to the human eye of of each increase in the number of pixels certainly becomes less and less – 4K is certainly coming. Smart TVs. This is all about integrating the internet – particularly web 2.0 – into TVs. Faced with the threat of competition from the internet, TVs are turning into internet devices. Many TVs now allow you to play YouTube videos, interact with a Neflix account, and so on. Expect services offered to multiply and expect the user interfaces to become less clunky as they evolve. TV leaves the house. For many of us, TV viewing is no longer confined to the sitting room, with TVs in bedrooms and kitchens. Increasingly we will see TV viewing (if indeed, we should call it that) leaving the house. Faster wi-fi and LTE mobile networks are delivering the bandwidth to allow much higher quality video streaming to the mobile user (though data tariffs will have to fall before most can afford it over mobile). Triple and quad-play. Remember the good old days when banks were banks, building societies were building societies were building societies and insurance companies were insurance companies? Those days are gone, and for television in Ireland they’re going too. The big buzzword (and the main reason that this blog covers TV) is convergence – that is, offering TV, landline and broadband (and maybe mobile, too) in a bundle to the customer. Telcos and pay-TV companies have found that the more products you offer your customers, the more money you make, so it’s coming. Vodafone’s CEO has stated his intention to offer “unified, converged, multiscreen services in all countries” and is threatening to follow BT into the pay TV market in the UK. Both Sky and UPC each has a broadband & home phone offering and UPC has been rumoured (albeit a little while ago) to be launching a mobile service on Three’s network. Eircom of course has a quad-play offering, eVision. Streaming replacing broadcast. In the old days we watched what the TV companies showed us, when they wanted to show it, even if we had a pay-TV service like Sky or UPC (71% of Irish TV-owning households use some sort of pay-TV according to the latest COMREG report). If you missed the Late Late show on a Friday night, tough. Then came VCRs and then PVRs, which allowed us to save programmes to watch later, as long as we remembered in advance. Now we have Netflix (over 150,000 subscribers in Ireland) and its competitors like LoveFilm allowing us to watch what we want, when we want it, without buying DVDs or recording the programme. And so we can watch eight episodes of the The Borgias (or, for Guardian readers, Borgen) at a sitting. Welcome to this month’s buzzword: binge-watching. User interface challenges. All new telly stuff brings complexity. The Sky box is a paragon of usability and compatibility, but some of its competitors fall short, and even with Sky, users will need a separate box for DVDs or Netflix. Many of us have multiple boxes and multiple remote controls. Your author has five such devices: the TV, a Ferguson Ariva combo box for decoding free satellite & RTE signals, a blu-ray player, a cinema sound amplifier and a WDTV box for playing stored movies. Each has its own remote control. It’s hardly intuitive. Original content from Pay-TV companies. We are used to pay-TV companies such as Sky and now BT securing exclusive rights to sports programming and early viewing to movies at home. Now Netflix and Sky are creating their own programme content. If their exclusive content is good enough, then they will attract subscribers based on the content itself. Netflix’s ‘House of Cards’ and its takeover of the the award-winning series ‘Arrested Development‘ seems to be starting to do just that. Sky Atlantic is following a similar path, commissioning documentary and drama content. Because viewers of television in Ireland depend so much on pay TV, this provider-specific content will become a significant factor in the battle for market share. A change in the TV licence: The number of households without a television in Ireland seems to increasing, as families turn away from broadcast TV and turn to the internet for their viewing. (When is a TV not a TV? When it is a computer monitor without a TV tuner in the back). Recognising this, the government is planning a levy on every household, whether or not it has a TV, to replace the TV licence. A brave and logical move. Interesting times ahead for the television in Ireland. Stay tuned. This entry was posted in Over-the-top services, TV on January 14, 2014 by Simon Rees. Is there any chance of an update on how these trends have played out since 2014?